It’s no surprise that babies, outside of their innate cuteness, don’t really do much the first couple months. My wife and I will call each other in a fit of excitement because the baby is smiling in her sleep. Meanwhile, we have 2 older kids doing all kinds of things, and they smile all the time, but we pretty much just ignore that, but if the baby sneezes, LOOK OUT! We stumbled on something with our first and have repeated it with each newborn. We stick our tongues out at them. And while I am no stranger to giving my children the finger when they are safely out of the room as a way to blow off steam, this is no such act. This is genuinely an amazing interaction with babies who can more or less do nothing else. We see them stick their tongue out, then we repeat them. 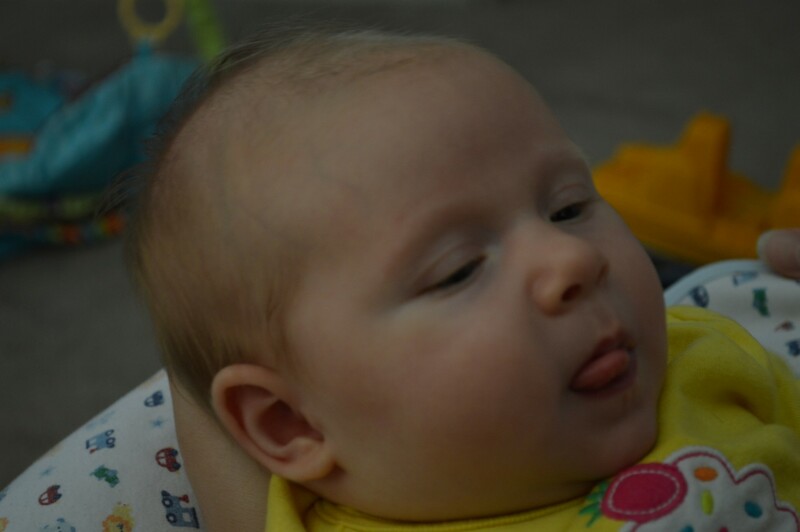 Somewhere around 5 weeks, we start to notice that when we stick our tongue out, they will reciprocate. This “game” can go back and forth for a few minutes, to great delight on both sides. Sarah is 8 weeks now and when she is in playful mood, as soon as she connects on a face, that tongue comes out. The first semi-giggle I heard came when a friend of mine stuck her tongue out in response to Sarah doing the same. Now, you may think you look ridiculous doing this…you do. But who cares? You are interacting with your baby who can’t control a single freaking muscle, other than her tongue. For an added ridiculous look, make an extremely large O with your lips stuck out as far as they possibly can, seriously, like a cartoon. At least for Sarah that is like watching the Holy Grail for the first time. Have you found any fun ways for getting a reaction from your newborn?